Community related news, announcements, competitions, events and more from the Staff. Post two intricately crafted Graphic Art projects in quick succession back in October-November last year, community member and digital artist Kevin Andrews had dropped off the radar — resurfacing only intermittently to put on display his written prowess via prompt-based Short Stories. This momentary break, was largely brought about by the large number of private portrait requests (viewable on his Instagram) from friends & peers that had inundated his personal agenda. Notable among these requests, was that by community member and PlayStation YouTuber Zack Swader alias Sonic_X49, which had Andrews construct an Avatar for the YouTuber’s online persona. The Avatar, christened Subject_X49 by Andrews, sought to encapsulate the best of Swader’s Video Game streaming personality while also deriving from Sonic The Hedgehog’s characteristic traits; notice the large ears and facial structure. By the end of it though, Andrews confessed that he had pretty much reached a ‘burn out’ phase with his true-to-life portraits — suggesting that it would indeed be a healthy amount of time before he returned to taking requests on the same. Halfway through Swader’s request though, Andrews jumped back to doing what he did best — challenging himself to a Graphic Art projects centred on a subject he hadn’t dabbled in before; that of Steampunk, Cyborg and Dystopian art based humanoid robots. Patchwork Companion – WIP #1, uploaded 22nd January ’16. Inspired by the works of Deviants begemott and bluefley, the Art project — titled Patchwork Companion — will have Kevin take his time through a multitude of weeks, constructing what he describes his first ever attempt at designing a humanoid robot. ‘I’ve Never done things like cybernetic parts before so… it’s slow going’, he adds. ‘I’m probably gonna watch a million speedpaints and tutorials on the subject on the way there.’ The project’s Album on the Community’s Facebook page in the interim, has been set up and will document Patchwork’s development over the forthcoming weeks. To keep track of its progress then, be sure to keep stopping by Andrews’ Higher Eclectic Art Space, which also holds previous art and written projects showcased by him within the community. For the first time in five months I believe, we — us on the staff at least — are in for a reasonably sound sleep. No, not because we’re short on sleep half the time anyway and that we’ve suddenly reached peak deficit; or that the Thai we had for lunch has us feeling dopey all day for some reason. It’s quite fairly because Higher Eclectic Ground has made its first, full-fledged footprint on the Internet in its still young life. That footprint being the very website you’re reading this on. Visitors new to Higher Eclectic Ground might not know the difference — that’s good, you haven’t missed much on the older thing we called a blog — and yet our returning members might probably need a few moments to take it all in; we’ve come a long way, haven’t we? When we started out on the 6th of August, 2015 — a website as such was frankly, the last thing on our minds. We were raring to get out there put into effect what was seemingly more than an offbeat idea at the time. And toiled we did, day after day bringing in new yet varied Video Game talent to the community, growing ours and our member’s presence on social media, having fun and bringing a lot of ingenuity and creativity to the table. The growth, courtesy of the support and appreciation of our members alone, has been been steady yet massive. As that growth occurred throughout the end of last year though, we realised that despite our best attempts at keeping things highly structured and constructive on Ground Zero — the Facebook Community — it was soon getting difficult to continually have our members track each other, find each other and stay in tune with everything happening on the community. We created a Forum, we organized explanatory, dynamic records of our members on the Facebook Page, we sent out monthly letters and yet despite it all deep down, we were beginning to realize that in the long run the Community wouldn’t function as a Community unless drastic changes were made. There was one very important need — a singular hub that would not only allow for quick access to community happenings but also engage a wider Gaming audience that lingered outside Facebook. The solution was simple; an intuitive, easy-to-read, interactive website that would consolidate everything we have ever done and will be doing in a singular spot — without taking away from any of the action or buzz on our base of operations, the Facebook page. Which is why as the world retreated to their caves for the holidays, we set about making changes to our structure on social media first– members would have noticed the minor and major tweaks that we made on a weekly basis to ensure that at least on that front, things were orderly. As we moved into the New Year, we quickly realized that if we were to set about doing the multitude of things we had on the Higher Eclectic agenda — we’d need a thorough, functional website. And so for the two weeks post January 1st we put a temporary halt on all our reaching out, channel building and accepting new members — deciding instead to focus on re-establishing ourselves first before thinking about progress. We confined our daily stream of posts to that of updates on our existing members while on the back-end, we created what you see here today. Without further ado then, whether you’ve been through it all or not — here’s a quick run down of everything that’s new within the website, how things function and where this particular portal is headed as a whole. Our trademark of a Banner gets company. Much as we are fond of that piece of art we have flying on every social-media page on ours, we thought it deserved a bit more activity than simply staying there on the home like it did on the older blog. Now, as you’ve probably noticed, it’s accompanied by a Stream; snippets of posts that are being made on the Facebook page, or any of our social media pages for that matter, in relation to the community and our members’ projects. Want a quick overview of what’s been happening over the day? Simply head down to the home page, take a gander at the snippets in motion and click the Facebook icon at it’s bottom to head to the Facebook page to read and learn more. Of course, this is not going to be the only thing on there. Think live-streams from our members, weekly airings of the upcoming BSRTC PRO Series Season straight from Apex Racing TV’s feed and more; Neat, yes? Note that mobile devices do not allow for Slider videos to play automatically and so, one might only be exposed to a video’s cover should they choose to access the website via their phones. Perhaps our proudest addition; we were quite uncertain if it would make its way to the website or not but now that it’s here, we can’t stop looking at it either. What the Member Catalogue effectively is — is a living, breathing portal to all the community’s projects and members. Know how every project of yours has its own Higher Eclectic Album on the Facebook page? Well all that we’ve done is set up a dedicated space for you or your game/product — depending on whether you are a Video Game artist/writer/musician/YouTuber or Game/Tech developer respectively — synced that space with your Higher Eclectic albums and given it an easy to remember URL. All of the Game/product’s corresponding Facebook Album’s descriptive details word for word. A meta-box that provides a quick overview of development status, contact details, immediate blogs and website. And more importantly, all posts from the Game/Product’s Facebook album. These posts are automatically imported as and when they’re made on Facebook. Sure you may have to open up the post via Facebook to read it in its entirety and watch any videos associated with it, but at least one no longer has to head down to Facebook first, open up one of the on-site records and find the abnormally long URL to their Facebook album to access it. Now, all it requires is one simple URL to keep track of your Albums and posts. Artists, Writers, Musicians and YouTubers on the other hand are categorised as themselves — allowing for members to easily find Video game talent to work with. Each attain their own Higher Eclectic Spaces with complete listings of all their present and past projects that — as with the Game/Tech creations — are synced to their respective Facebook albums as well. Easily find other members to work with, follow up on favourite projects and most of all? One can now share their Higher Eclectic albums with anyone as and when they please thanks to the simple URL and everything else being at one, singular spot. When the Catalogue was still Work In Progress. Back in the day, our articles mainly dealt with special features on community projects or the occasional announcement while staying dead for the remainder of the time. Now however, we’re gunning to turn it active than it’s ever been — not just the usual video game test reports or competition announcements; but instead regular notices of new additions to the community, major developments related to community projects, regular sneak peeks into what we’re working on the back-end and so forth. We’re hoping to keep the website as active as our social media profiles themselves, hoping to involve a wider Video Game audience in ours and your work. So, while the News & Notes section will contain community announcements and Editorial banter, Features will be restricted to special coverage of member projects in the form of close-looks and interviews. An ‘About’ section was one of the driving forces behind us deciding to put together a revamped website. In all frankness there’s so much that the community does at any given time — that it was fast becoming difficult for us to type out long messages in personal chats and go back and forth with questions which in-turn, reduced potential member patience. Moreover those new to Higher Eclectic Ground didn’t really have an easy time reading the cramped introductory post on our Facebook page that was packed with links for illustrative purposes. Now, we’ve got everything we do covered within the ABOUT section and because that isn’t enough, we’ve even created and referenced a little FAQ in various sections of the website. The FAQ was compiled on the basis of feedback and enquires received by us in the past and so rest assured — it will continue to stay updated. Both the ABOUT and FAQ provide an in-depth look at what we do and why we do it, making it the perfect read for our members new and old. Always thought contact forms were cool and said let’s get one for ourselves. Not only does the Contact page allow for potential members to quickly drop us a line — but also directs them to the Bulletin where all the discussion is. In the past, things might not have been entirely clear on how our partnerships benefit members of the community. Which is why, we’ve devised a thorough space for our partners that not only brings a constant stream of audio, visual and social media content from their respective domains but also elaborates how they function with respect to Higher Eclectic Ground. Make sure you take a trip down there before leaving here. Our monthly issue of ‘In Eclectic Perspective’ that lends perspective on community happenings from the month? Visitors and members alike can sign now up for it with ease by simply entering their details in the form in the footer, or by ticking a check-box at the end of any of articles while posting a comment. Yes, this. This simple, pure little interface to read articles over without distraction that we think is the cleanest thing ever. What comes next? Why, it only gets better from here. Now that we’ve firmly established ourselves and what we do — we intend to gradually add a variety of user features to the website based on how the community grows, public opinion and response. Make no mistake, the heart of the community will continue to dwell on Facebook, no doubt, but as a one stop spot to everything Higher Eclectic — this website is key. That being said, anything you would like to see added or would like to see the community head towards — we’re always willing to hear from. In the interim, go mad going through all the Higher Eclectic Spaces and content we’ve put up here. Once done, let us know what you think here in the comments or down at the Bulletin. For now, it’s Good Night — the community should resume its usual barrage of activity by tomorrow and hey, we definitely have some fascinating news lined up for you this week. Title image artwork by community member Richardson Cleetus. Promoting Your Indie Game and Art Ventures Via Sim-Racing. October 27th, 2015 marked a valuable milestone within the Higher Eclectic Ground calendar. Post a month of discovering the British Sim Racers and their BSRTC Touring Car Championship – an IRacing based, sim-racing Touring Car Championship that has 50 of the racing subscription service’s most talented drivers competing for a slice of the $10,000 prize fund – we’d constructed an elaborate never-seen-before biography of the BSR’s rise from being but a dream harboured between two individuals to being the first IRacing based Touring Car championship to be aired on MotorsTV UK. Yes, MotorsTV – a name well known within every British racing enthusiast’s home for bringing world-class events such as the World Rally Championship, the FIA World Endurance Championship, United SportsCar Championship, V8 Supercars, British Formula and much more, 24 hours a day, 7 days a week to homes across 41 different countries worldwide. The biography set into motion a lot of things for both the BSRTC and Higher Eclectic Ground – we are currently in communication with SimRacer, the world’s first commercially available sim racing magazine, to showcase the article within their January 2016 issue; we’ve partnered with the BSRTC to provide post-race reports of each of their remnant races that take place every Thursday at 8.15 GMT; we’re in communication with IRacing’s News counterpart to feature those weekly reports and now – with barely two weeks left till the end of the season – we are offering our independent video game and art members an opportunity to promote their ventures, on British Motorsport television. British Television? How Do You Mean? The BSRTC is near the end of its biggest, most expensive season yet – with 35 races of three rounds each spread over the year that has been and a $10,000 prize fund. 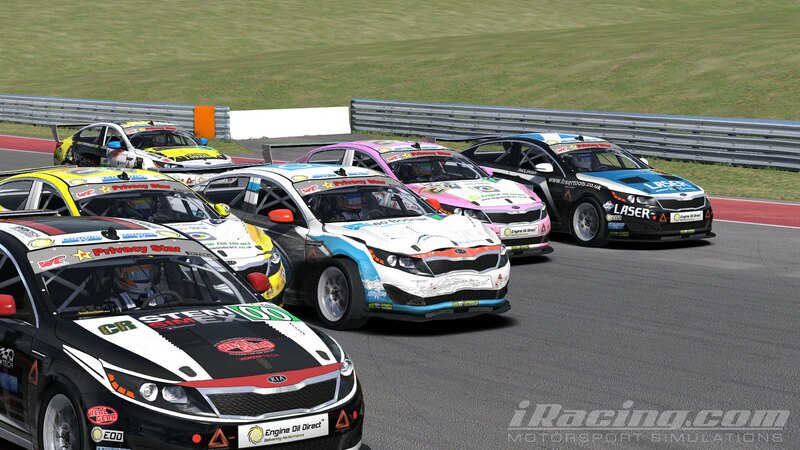 Every Thursday at precisely 8.15 GMT, the British Sim Racers’ Touring Car Championship Pro Series takes to a variety of tracks for three rounds of adrenaline packed racing. These races are broadcast live on ApexRacing TV’s Youtube channel – known to be a regular broadcaster of numerous sim-racing events – and IRacing’s official Twitch channel to reach a cumulative racing audience of well over 2,000 based on the stats associated with each video. In addition, as part of the BSRTC’s partnership with MotorsTV UK this year – every race’s highlights are broadcast live on the motorsport channel two weeks post the actual occurrence of the race. Our partnership that serves to boost their awareness within the mainstream gaming community only serves to help those numbers and well, it’s safe to say that it’s been an eventful one month. With such a solid membership and audience base – a large part of which are video gamers – we couldn’t help but fathom the opportunities this would help provide the Independent game developers and artists we serve to promote and assist with growth every day. One of the primary contributors to the BSRTC’s success this season has been its elaborate and creative sponsorship structure. Every ‘team’ of drivers is owned by an entity that has thus far, contributed £25 per event. This contribution earns them a team of their name and the privilege of having their name mentioned, associated and reported with their team’s drivers in every broadcast, report and piece of gossip – definitive coverage. With that said, the sponsorship structure’s biggest plus point so far has been its willingness to welcome any additional ‘sponsors’ to the championship at a moment’s notice. By paying £5 per event – one event at a time – new sponsors can jump into the series prior to any given race and sponsor any one driver, allowing them to have their venture/company logo pasted on the side of that driver’s car. ApexRacingTV’s camera control ensures that the cameras hit the sides of the car when they can, providing these ‘guest’ sponsors with momentary coverage for the duration of the three-round race. We were blown away. What if – we had each of our independent video game developers and artists sponsor a driver for the duration of a race? Wouldn’t this help with exposure? Not sufficiently, and so we sat down with the BSRTC to come up with additional privileges – a new ‘guest’ sponsor would not only have their logos pasted on a driver’s car, but also attain a mention from the commentary team prior and during the duration of the race. With that settled, the races held at Donington Park and Interlagos on the 29th of November and the 12th of October respectively had us offer two of our members the opportunity to sponsor not just drivers, but whole teams on behalf of their independent game ventures. On the 29th of November, member AJ Picard and his mobile-based Video Game index EyeGames app sponsored the Engine Oil Direct team – while on the 12th of October Video Game Blogger Mike Blundell and his blog Mike’s Pad sponsored the GT Omega team. Both garnered mentions through the course of the races during their livestreams which carried over to their television broadcasts. While both were satisfied with the mentions and coverage they’d received – we weren’t. Sure their logos were noticed and so were their mentions, but we began to realise that not only did they seem unnatural but took away from the racing as well – a point the BSRTC made rather aptly. With three weeks to go till the end of their season then, we sat down yet again and make one final revision. Officially Inviting The Higher Eclectic Community As Sponsors. A logo of their Game/Game Studio/ Product/ Blog/ Venture imprinted on the hood, side and roof of a driver’s car. A GT Omega Team Car Flying The Mike’s Pad Colors At Interlagos. A 30 second video slot during the 10 minute breaks between each of the rounds that allows them to have a short-trailer of their creation showcased during the races. The Current Roster Of Ads Serving As Fillers. A special pop-up during the MotorsTV edit of the race since the advertisements do not carry over, that sponsors can edit and fill in with a short-quote and logo of their choice to be aired on National Television. About two-three pop-ups will be displayed within a 12 minute segment of the 1 hour MotorsTV broadcast. The First Ever MotorsTV Stream From August 20th, 2015 At Laguna Seca. Note The Pop-up At 1:20. With only 2 weeks remaining till the end of the Season – the next two races being on the 23rd of November and the 3rd of December – we are now inviting each of our members to have their independent video game and art ventures promote a driver for one, if not both the races. £5 to cover costs incurred by the BSRTC and Higher Eclectic Ground. A 25-27 second video trailer to have featured as an ad within the livestreams. Note that these are deliberately kept a few seconds shorter than 30 to allow for us to fly the ‘Higher Eclectic Ground’ banner at the end of the video and announce our support. A logo that you would like to be displayed on the car and the pop-ups. A one-liner for the pop-ups. It is advised to keep the trailer and the quotes as entertaining and explanatory as possible for maximum effect on the 2000+ audience tuning in to livestream and the larger majority tuning in to the television broadcasts. Schedule For The Final 5 Races. Remaining Races. ApexRacing TV/ IRacing Livestream Date and Time. MotorsTV UK Air Date and Time Deadline Submission Of Sponsor Details. 1. Sebring. Thursday, 26th November, 8.15 PM GMT. Tuesday, 15th December, 6:23 PM GMT Wednesday, 25th November. 2. Daytona Road Thursday, 3rd December 8.15 PM GMT. Tuesday, 22nd December, 6:23 PM GMT Wednesday, 2nd December. Only two races remain as per the schedule above – i.e the one at Sebring on the 26th of November and Daytona Road on the 3rd of December. Those interested can opt to sponsor a driver for either one or both of the races. Either way, all details and queries should be e-mailed to [email protected] before the aforementioned deadlines. Unprecedented. There’s a lot we have in the works for next season – and it involves you. All of that will be announced in due time of course but till then – running a crowdfunding campaign, a Steam Greenlight campaign, in need of a few views on your blog/podcast or just looking to have your creation associated with motorsport? Never before has there been an opportunity as such. Meanwhile, Higher Eclectic Ground is not only covering the last three races of the BSRTC’s Showdown, set to be streamed live on ApexRacing TV’s Youtube channel at 8.15 P.M GMT every Thursday. To make sure you do not miss out on anything, do head down to our Facebook page where all the activity lies and ensure you’re signed up. Moreover, those interested in racing with the BSRTC community or simply hanging out with them by the pitlanes, can do so by signing up to their closed group on Facebook . Those still doubtful about what the BSRTC is all about meanwhile can learn more by viewing our previous coverage of the same which also includes a never-seen-before look at the championship’s rise.